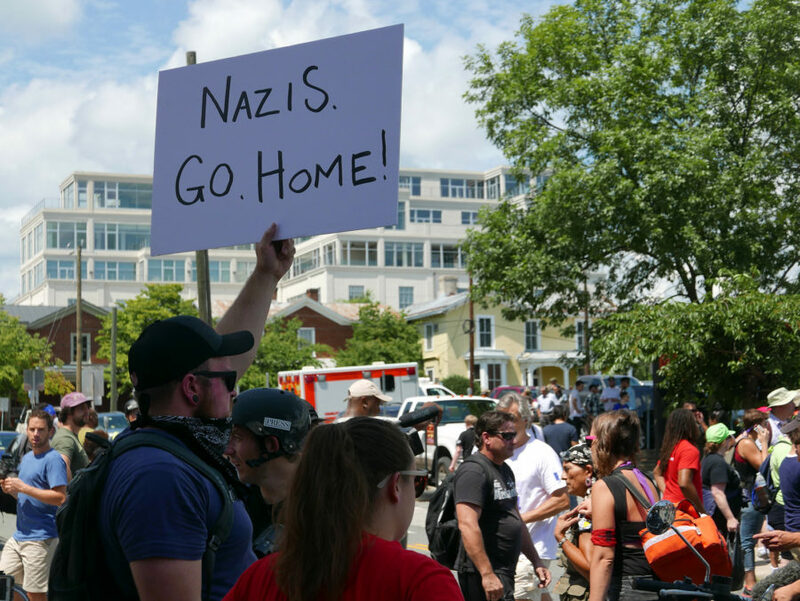 Last year, the Unite the Right rally in Charlottesville, Virginia brought together white supremacist groups from all over the country to demonstrate their volume, in both senses of the word. They cut ridiculous figures at first, dressed in khakis and polo shirts, wielding citronella candles, and shouting awkwardly. Their presence was met by a robust opposition, comprising local chapters of Black Lives Matter, Democratic Socialists of America, Industrial Workers of the World, and other groups. But the rally took a violent turn. A young white nationalist named James Alex Fields, Jr., drove his silver Dodge Challenger into a crowd of counter-protesters, leaving many injured and at least one dead. The term “many sides” drew rightful scrutiny from many observers. In a confrontation between racists and anti-racists, in which a racist’s actions resulted in the death and injuries of anti-racists, it’s a strange geometry that identifies multiple equivalent sides. President Trump’s reticence betrays a reactionary bias, which comes as no surprise. But his rhetoric was not unique to him — the mainstream media and liberal intelligentsia had set the precedent. The day before the rally, the Wall Street Journal published an excerpt from an upcoming book by Mark Lilla, The Once and Future Liberal, which suggested that leftist anti-racism creates a “centrifugal” force, causing a movement to spiral out and splinter into factions. Even if we grant him his convoluted metaphor, based on a concept considered nonexistent by modern physics, it leads him to dangerous conclusions. The first reported death from Charlottesville was of Heather Heyer, a thirty-two-year-old paralegal, who appears from her Facebook page to have been a Bernie Sanders supporter. “If you’re not outraged, you’re not paying attention,” says her last public post. The cheapness of deriding “Bernie Bros” or comparing the left to the alt-right becomes all the more offensive in light of her courage, and the tragedy that followed. Looking at circumstances like these and seeing “many sides,” indistinguishable from each other, is a stance that history has never revealed to be anything but moral cowardice. This stance is the subject of Graham Greene’s novel, The Quiet American, which follows Thomas Fowler, a journalist in 1950s colonial Vietnam who is dedicated to remaining objective in any situation. He befriends an undercover CIA agent named Alden Pyle, who advocates for a kind of centrist politics he calls a “Third Force” — one that opposes both communism and colonialism, viewing them as equal threats. When Fowler finds out that Pyle was involved in an act of terrorism in Saigon, detonating a car bomb and killing innocent civilians, he goes to speak to a member of the Communist Party who he knows as Mr. Heng. “Sooner or later… one has to take sides — if one is to remain human,” Heng tells him. The liberal center has to heed the same warning. In order to reject Trump’s equivocations about “many sides,” we have to take one. There is a side that asserts our common humanity and fights fascism, racism, and hate. It was represented in Charlottesville by the leftist groups who took to the streets to confront the far right. The other side is the one that took innocent lives on those same streets. The stakes are high. We have to choose.